Airbnb Reviews – How Do I Book The Right Airbnb? Initially, I spent many hours procrastinating over Airbnb reviews and which accommodation to book, often missing out on the ones I preferred. To avoid this happening to you, follow our step-by-step guide below to quickly and efficiently find the perfect place to stay on your next vacation. After several Airbnb stays I have found out what to look for when booking. It can be confusing as major cities can have hundreds or even thousands of homes for rent. Many places scattered all over the city, all offering different amenities and options. Step 1: Where to Stay- City Dweller or Suburban Freedom? Figure out what’s important to you and aim to stay in those areas. Some people like the busy, chaotic inner city streets while others prefer returning to quiet, peaceful suburban places to spend their evenings. Are restaurants and nightlife your priority or maybe it’s the major tourist attractions that you prefer to be close to? If you have spent time in the city before then you may have an understanding of which areas you like. If you haven’t been before, simply google ‘best areas to stay in …….’ or ‘safest neighbourhoods in …….’. Alternatively, you can use the Airbnb guidebooks here. 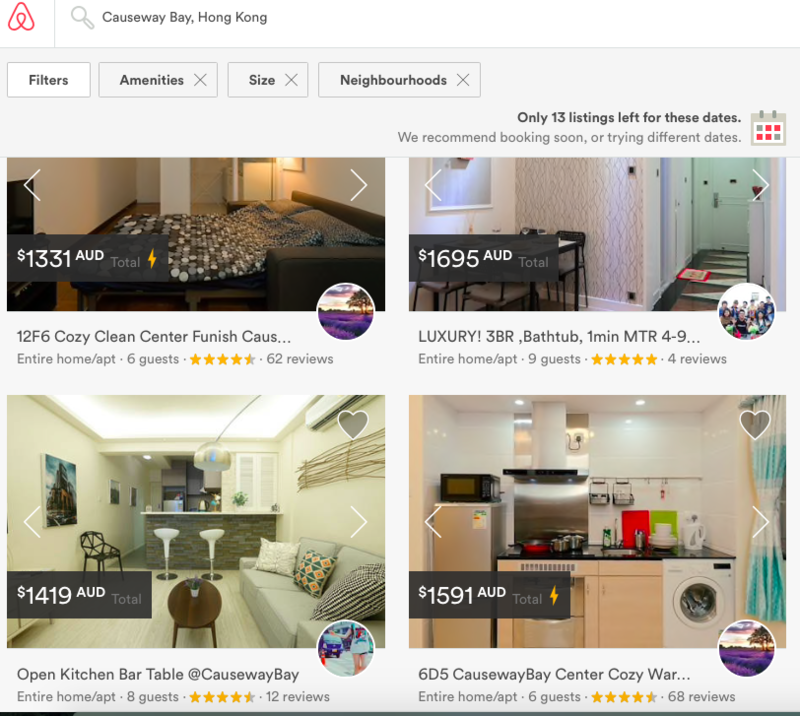 By focusing on specific areas or suburbs in Airbnb searches, you narrow results and eliminate some of the indecision that comes with sifting through too many options. Step 2:Basic Bits. What do you Require? Which dates am I travelling? Don’t be too stringent with this initially, because prices and places in search areas can vary due to additional costs such as the cleaning and Airbnb fees. Also, depending on your length of your stay you may receive a discount. You can always ask the owner for their best offer before booking. Lastly, do you want to rent an entire apartment, a private room from someone or even share a room? 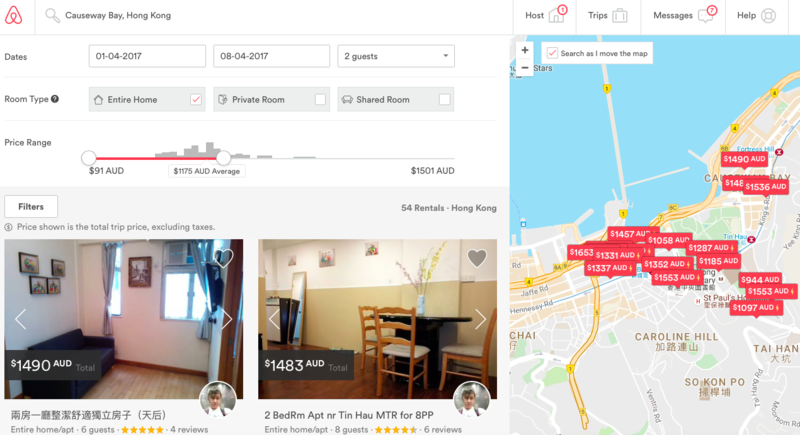 As you can see by my example in the image below, I have already narrowed search results in Hong Kong from over 1000 down to 54 by putting in my dates, the area I prefer to stay in, and specifying that I want a place to myself. It is noticeable that homes with high star ratings will now feature prominently. The above tabs will be on the Airbnb reviews page. Click on ‘Filters’ and a drop down menu will appear with many options. This is where I typically add all those (un)necessities that I would like to have. • Wifi – it’s best to have wifi available, either for business or as a tourist. • Air con/heating – if the weather is uncomfortable then a nice home can feel like a luxury. • Washer – great for stays longer than 3-4 days. • Iron – clothes generally need ironing after travel and especially if I have the need to wear more than a t-shirt. You can tailor these settings to your needs. The cancellation policy can also be important if you’re in a situation where you think you may have to cancel. No-one wants to lose a large deposit just for cancelling a trip. After filtering my example to include a washer, iron, air conditioning and wifi, , I am left with 13 options of 2 bedroom apartments. These vary in price and star rating with many having a full 5 star (excellent) Airbnb review rating. After narrowing your results, it’s time to deep dive into the properties one by one to explore their images, review their amenities, read comments from previous occupants and their overall rating. (b) if I am looking to get the cheapest possible deal and am prepared to sacrifice quality for price. This is where an Airbnb coupon comes in handy, I always make sure I take advantage of any Airbnb coupon codes that are available. In my example above, many homes both have 4.5 or 5 star ratings. • Wide angle cameras can make spaces look bigger than they actually are. • Professional shots enhance a space compared to smart phone images. • People will often put only 2-3 images of the accommodation, but many more of the surrounding suburbs. This is not ideal. • Understand that photos taken by amateurs (the owner) may not showcase the property as well as professional shots. When you’ve found a gem that fits your needs, it’s time read the Airbnb reviews thoroughly to see what others have said about staying at the property. Airbnb reviews will give you an insight into any possible problems that could arise. Take the time to read at least 5-10 reviews. If anything stands out that you think may be an issue, start your search again. Step 5: Take the Leap and Book It! If you are satisfied with the reviews then pull the trigger and book your Airbnb! In my example, 3-4 places are similar in terms of price, size and rating. In that case go with you personal preference or even drop the price to narrow results further. Once completed, take the next step and make a booking. Procrastination is normal on your first Airbnb attempt, but trust us when we say it’s best to be smart, do your research and book quickly! 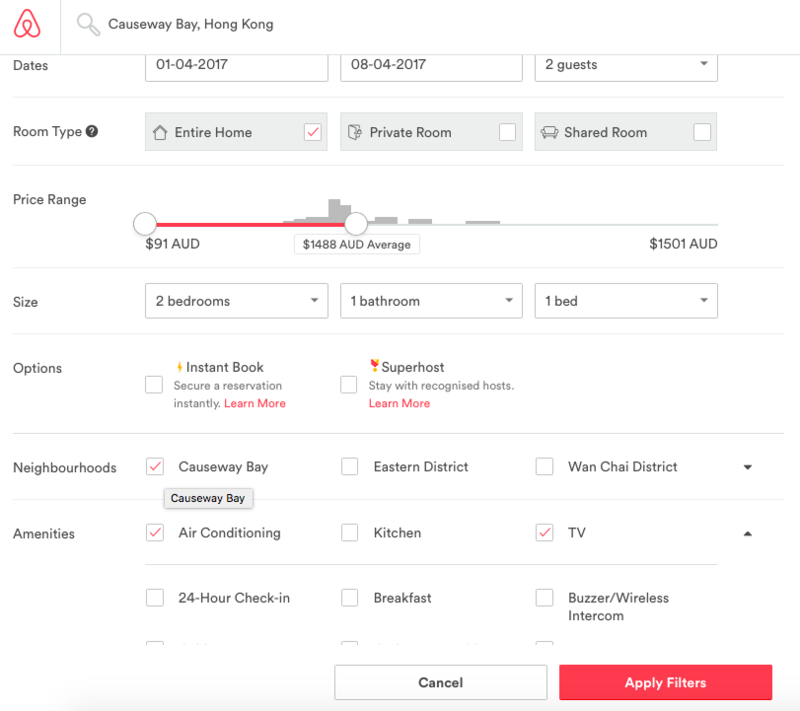 **the Airbnb accommodation options in the examples in this article may no longer be available for rent.